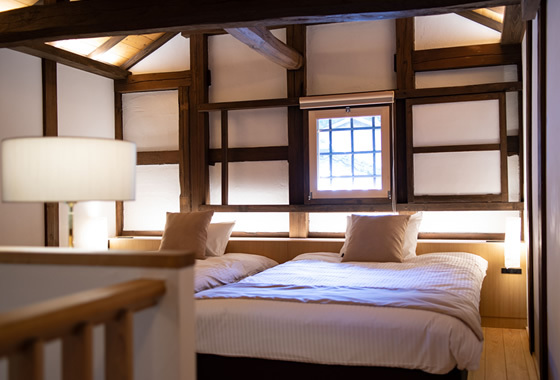 A classic and exclusive boutique hotel renovated from a Japanese traditional house. 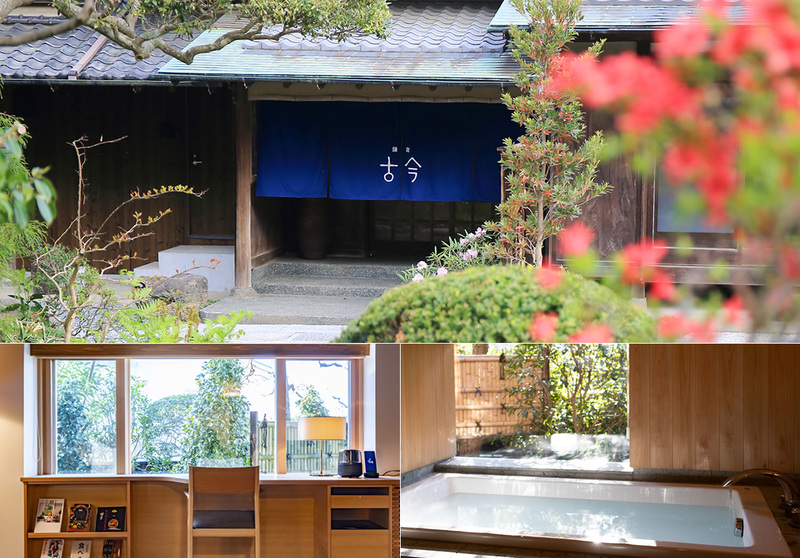 Experience a luxurious trip to the past in the ancient city of Kamakura. Kamakura is known as the“home of the Samurai”, one of the most famous tourist resorts near Tokyo with many historical sites. “Cocon” stands in a quiet neighborhood, surrounded by many old temples and Buddha, it is the best location to enjoy Kamakura. The house was originally built over 160 years ago, and has been completely transformed into a beautiful boutique hotel retaining its traditional images from the past. 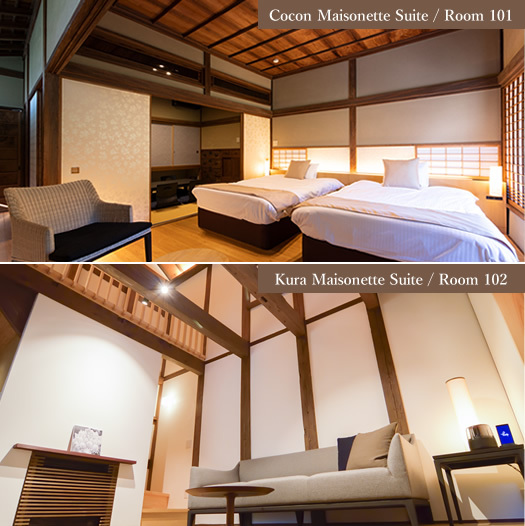 We offer you an exclusive stay in the spacious suite room with a living room, Japanese tatami room, bedroom and bathroom. Please enjoy the cuisine from our Italian restaurant, and warm welcoming concierge services to make your stay unforgettable. 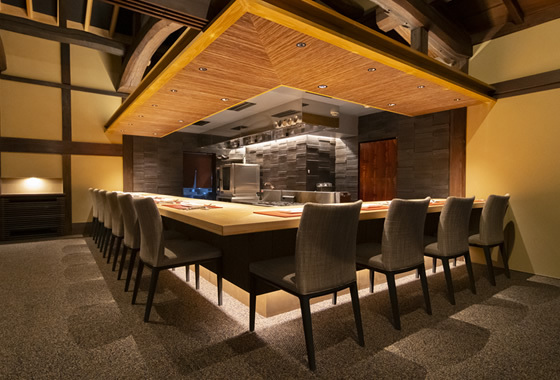 We are happy to become your home away from home, with our Omotenashi (Japanese hospitality) spirit. We welcome only two parties a night for your quiet and relaxing stay. and a luxurious bedroom & bathroom to make your stay pleasant. and moisturize and smooth your whole body. The micro bubble bath is available 24 hours daily during your stay. Music, aromatic scents, and the finest bedding made in Japan, complete your luxurious stay. Our bedding is made by “Airwave”, the leading company in the bedding industry. Music and aromatic scents of your choice make your sleep more exceptional. A good rest will take away the stress of traveling. Free Wi-Fi, Handy (mobile phone available to carry outside the hotel), Smart Speaker, “Airweave” brand beddings, original “Yukata” (Japanese traditional cloth), Nightwear, safe-deposit box, hair dryer, botanical bath amenities, tooth brush,razor etc, free drinks in the mini fridge (6 kinds of beers and beverages),espresso machine, 3 kinds of health tea. ※Consumption tax is not included. Your relaxed conversation and ability to observe the chef prepare your food makes for a unique gastronomic event. You can privately chat with your partner or enjoy conversation with our friendly chef across the counter. Feel free to make requests or ask about ingredients or recommended specialties. from the local Kamakura farms and seafood from the Sagami bay. Seasonings and spices are used sparingly to improve your health. Please enjoy the fresh and flavorful organic food from the kitchen. 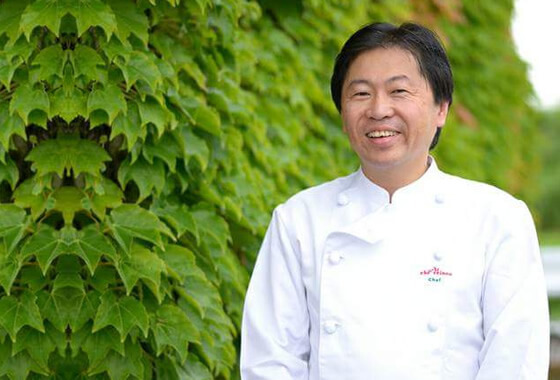 Menus are supervised and produced by one of the top Organic Italian food chefs in Japan. 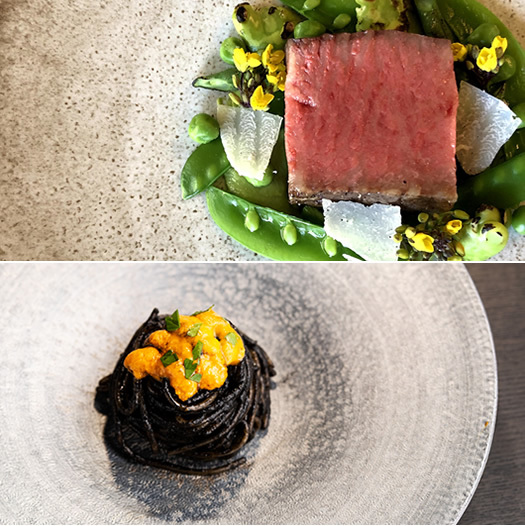 Please try our creative Italian cuisine influenced by Japanese, French and even Kanpo (traditional medicinal food). ・Reservations only. Please make a reservation the day before. 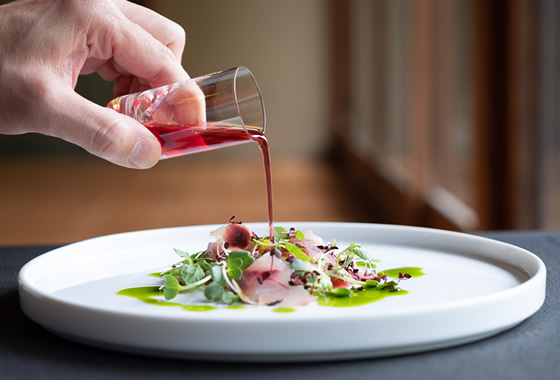 I’m not a hotel guest, but may I visit the restaurant? Yes, lunch and dinner are available to the public. Please make a reservation at least one day in advance. Can we book the entire hotel for ourselves? Yes. 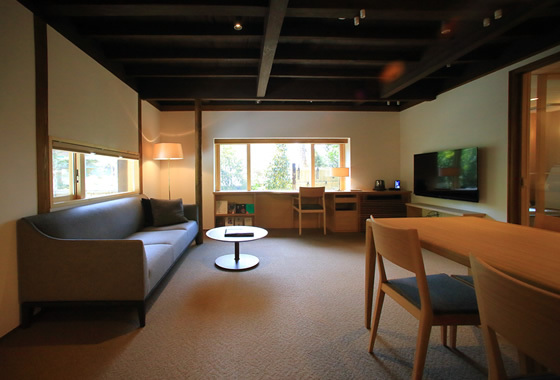 The entire hotel is available for up to 8 adults per night for 500,000yen(includes dinner and breakfast). Check out time is 11:30 am the next morning. Both the hotel and restaurant welcome children over 10 years and older. However please be reminded children will be served with the same dishes as adults in the restaurant. If you have a child under 10, please book the entire hotel. We are sorry to say pets are not allowed at our facility. 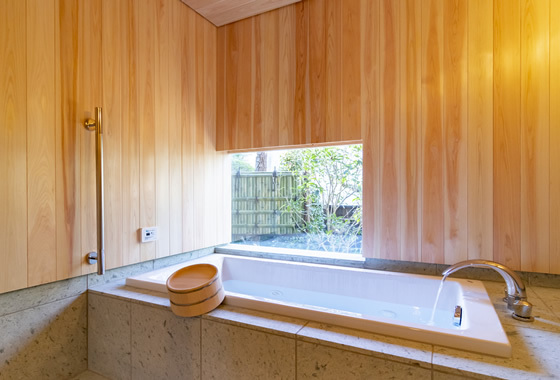 Is the bath “onsen” (natural hot spring)? It is not “onsen”. However your bathtub in your suite room is fully filled with hot water 24 hours throughout your stay,The micro bubbles, which revitalize and relax your body are also available. Is transportation to the hotel available? Yes, we will pick you up, or take you anywhere within the Kamakura city in our private car. Please make a reservation beforehand by phone or email. Yes, you may use our free Wi-Fi anywhere in the facility. Is it a smoking or non smoking facility? Both our hotel and restaurant are non smoking facilities. Cigarettes of any kind, including pipes and electronic cigarrettes are forbidden. Is the facility accessible for wheelchair and physically disabled people? Sorry to say our facility has steps and stairs because it is originally 160 years old. Yes. The concierge will accommodate according to your needs for room services. Check in time is 15:00 and check out time is 11:30. Yes, there is a cancellation fee. We charge you 30% of the total fee 6-7 days prior to arrival, 50% 2-5 days prior, 80% 1 day prior or on the day of your arrival. You will be charged the full amount if you do not contact us beforehand. Our restaurant has the same policy. Is there a private space outside the suite room to hold a meeting or a conference? Yes, please contact our staff beforehand to reserve the lounge for your private use. We are only an hour trip by train from the center part of Tokyo, and also easy access from the Haneda airport. We welcome your visit to our resort in Kamakura, surrounded by the beach and mountains. For our hotel customers, our car will be waiting for you at the Kamakura station West exit on your arrival. Also, it will drive you anywhere within the city of Kamakura during your stay. AM9:00-PM6:00 / Closed on Wed&Thu. ※	Please enter our address (not the phone number) on your car’s GPS. Please fill in this form to contact [Kamakura Cocon] and [Restaurant Cocon] for any requests or questions.